Estrons + Guests. Independent Venue Week. 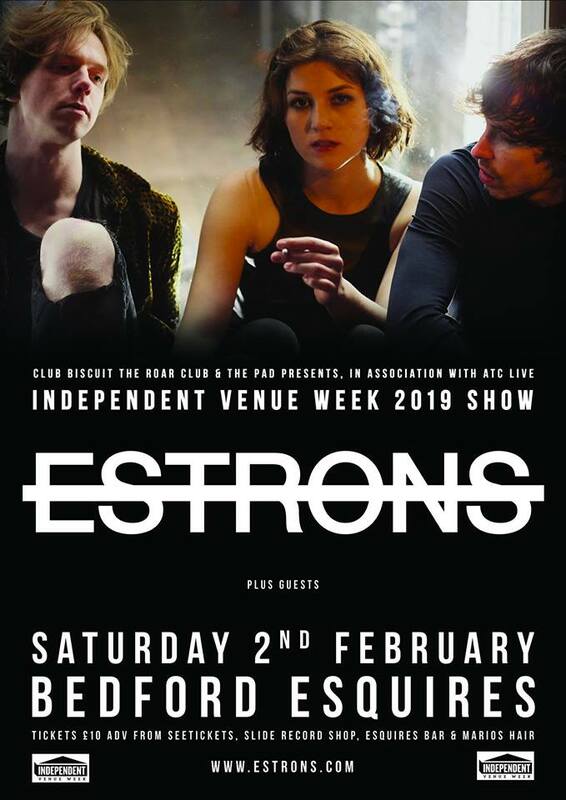 Club Bicuit, The ROAR Club and The Pad Presents are very pleased to have teamed up for a special show with Estrons for Independent Venue Week 2019 on Saturday 2nd February 2018. IVW is a week long celebration of grassroots music venues, that takes place across the UK and we have a tasty line up throughout the week, culminating in this Estrons show. On very rare occasions, from the most destructive of places, beauty can emerge. Ever since singer Tali Källström and guitarist Rhodri Daniel met as “two strangers with disparate tastes and influences,” the two have been carving out a body of work that resembles an essence of chaos and beauty; a feeling of estrangement, an expression of morbid elegance, inspired by opposing sides. The funny thing about opposites, is they need each other in order to exist – one wouldn’t be what it is without the other. From this place of tension, Estrons found their debut album. Ultimately, the bind that ties them is their love of creating fresh, exhilarating music, and with ​You Say I’m Too Much, I Say You’re Not Enough​, they’ve done just that.Beginning as an experiment, Estrons quickly became significantly more important than intended. They are simply aforce that cannot be forced. Vocals and instrumentals collide together throughout, creating a wild, beautiful noise – likely mirroring the self-confessed love/hate relationship between Rhodri and Tali, tied together by bassist, and long running producer,Steffan Pringle, whom they eventually convinced to join them. Despite the odds, they have captured a sound of their own. Estrons’ music “can be off-putting at first glance,” says Rhodri. “It’s only when you make your way through it that you get it. I have no time for music that doesn’t leave some sort of a mark.” And nor, evidently, does he make it.